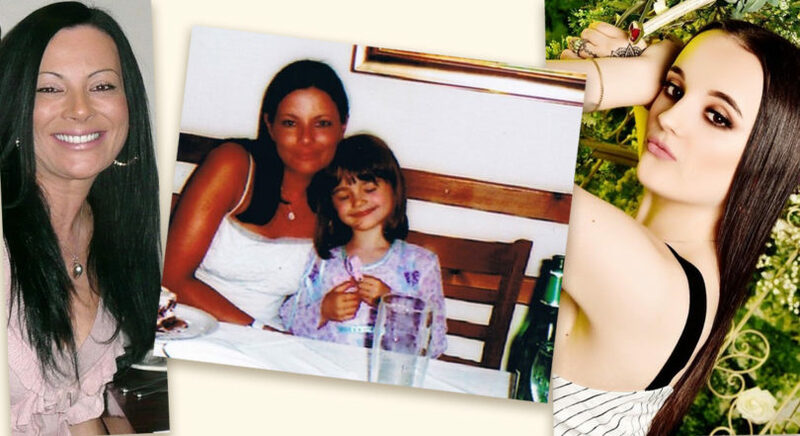 When just a teenager, Abi McCabe (right) lost her mother Julie (pictured left). This is her story. When I was 16, my mother died. Losing a parent at a young age really teaches you a lot. It makes you grow up a lot faster, become more independent, and stronger emotionally and physically. I felt really lost for a while and felt I had nowhere to turn or no one to talk to about what happened. It has taken me seven years to be comfortable enough to talk about what happened to my mum. I was just 15 when I saw her have an anaphylactic shock on my front drive. She had just put dye on her hair and – as I learned later –had had an extreme allergic reaction to the dye. Her heart stopped beating before she was resuscitated, but then she slipped into a coma with extreme brain damage. She died just over a year later. I stopped going to school for a while, just trapped with my thoughts, before trying to cope and feel like a normal teenager again by going back. Years later I realised that was the complete wrong thing to do, as I bottled everything up. Looking back, I probably should have faced what happened more – it has affected me really badly as an adult. I developed really bad anxiety and I was rushed to hospital a couple of years ago as I had a really severe panic attack. The doctors said that it was the grieving. They suggested meditation and breathing techniques to calm down before bed, as the night times hit me hardest. I had difficulty breathing and I would sweat and shake. A year ago, the anxiety started to lessen, but it still comes back in waves. Keep positive to the best of your ability. It is the only way forward. You are not alone. Find out what really makes you happy and do it. Set yourself a list of things you want to achieve in your life. For me, time with friends and family is crucial. They know how to make me happy and love me unconditionally. Going abroad and going to new places creates peace in my mind and body. Trying different activities and getting out of the house really does help mentally and physically. Meeting new people and hearing about their lives really helps me too. As hard as has been to write this, it has helped me get a lot off my chest. I want to share my story to help raise awareness of allergies in chemicals. Please take a patch test if you’re dying your hair (particularly if you dye it darker, as there is a really dangerous chemical inside called Paraphenylenediamine (PPD)). I will keep my mum’s spirit and memory alive as much as I can. She left her mark on the world and she loved to help people. It is heart-breaking for me knowing she has missed out on so much already. But I know she is there in spirit. She definitely lived a lifetime in her 38 short years and I will live my life the way she did – to the fullest. You can read more about Abi’s mother here. For information on anaphylactic shock, click here.